The combination of more jobs (the BLS reports an increase of 148,000 jobs for September) and a somewhat more stable economic outlook has likely contributed to the steady increase in voluntary turnover that has been seen both locally and nationally. For example, since 2010, voluntary turnover in Northeast Ohio is up to 10% (an increase of about 4%) across both manufacturing and non-manufacturing industry groups. For the employer, working with a less risk adverse workforce that is willing to leave a job voluntarily in search of new or better opportunities typically means that money will have to be spent- both in terms of the losses in productivity during a vacancy and in terms of the costs of getting a new employee up to speed to fill their shoes. Below, we take a closer look at just how much these separations and the corresponding replacements are costing employers in Northeast Ohio. Tracking exactly how much each vacancy and corresponding new hire costs an organization is a challenging, but much sought after metric. Unfortunately, due to the complexity of the various factors that must be considered when calculating these total costs, many organizations struggle to come up with an accurate resulting dollar figure. For those organizations with more sophisticated tracking mechanisms in place, the Society for Human Resource Management recently published a “Cost-per-Hire Standard” which outlines a variety of hiring and recruitment cost related formulas and calculations. Even if you organization does not have the capacity to subscribe to these more complex methodologies suggested by SHRM, setting your own standards of measurement internally and starting to track them consistently can still be a huge help in understanding how your costs are tracking from year to year. The figure below gives a breakdown of two key metrics as reported by participants in the 2013 ERC Hiring Trends & Practices Survey. 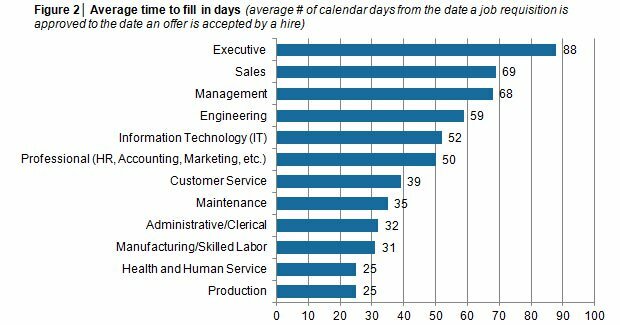 Another telling hiring metric that many organizations use to gauge how costly separations are is “time to fill”. A bit more straightforward to measure than “cost-per-hire”, this figure does not give an exact dollar amount, but is still helpful in a general sense. By understanding how long different types of positions are likely to sit empty as a replacement is recruited organizations can ideally plan to re-allocate resources/job duties more efficiently during the recruiting process in order to minimize the costs incurred during a longer down time. Reports trends in local hiring practices ranging from background and drug screening, to references and pre-employment testing, as well as common local hiring metrics and other factors of the hiring process that influence employers’ ability to attract talent among 114 Northeast Ohio employers.